If you are looking for a company that offers sale and installation of bathroom countertops, contact Divine Design, as we have many quality stone countertops, as well as years of experience working and installing countertops of materials such as Granite, Marble, Quartz, and Onyx. Bathroom countertops are a very modern and functional decoration solution, as they allow us to give any space a touch of distinction and elegance thanks to the beauty provided by natural stone, as well as offering a convenient surface. These countertops are ideal for the sink area and will give you a sophisticated and modern air without compromising on its functionality. In our company, we design and install custom countertops for your bathroom. We are experts in the design and installation of complete bathrooms made of natural stone, which means that we can advise you in an experienced way of the best materials, colors, textures, and countertop thickness for your bathroom. To choose the right countertops, it is important to consider both the materials that you want to use and the aesthetics of the room. This last concept is important so that your bathroom has a harmonious appearance throughout the space. 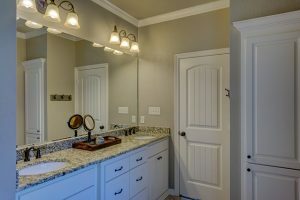 We can offer you a wide variety of all types of countertops, all colors and finishes to install in the bathroom of your home, your company or anywhere, with ample possibilities so that the countertop fits aesthetically within your space. We know how important it is to establish timeframes, at Divine Design we always work to meet these deadlines, but never compromising the quality of work, which is equally important and makes the final result perfect. With over 15 years of experience in the industry to carry out the installation in the most professional way and whose results achieve maximum satisfaction. Our promise is a large selection, quality materials, professional installation service, and affordable pricing. Just contact us for a free no-obligation estimate for your project, or let’s discuss your budget and the possibilities we can provide.